Cattle is (or was) the oldest and most representative industry in Cuba. At least it can be considered the forgotten one. For a period of over thirty-five years the information about the cattle industry has always been incomplete, casual, incorrect, and in general, lacking the importance that it deserves within the total framework of the Cuban economy. It was always taken for granted. Even today, the industry is the one that is subject of “guesstimates” more than any other one in Cuba. And we are talking about an industry whose ratio was to the Cuban population what the automotive industry is to the United States’ population. Christopher Columbus took to Hispaniola the first cattle and from there it was introduced in Cuba by Diego Velazquez. From 1512 to 1524, the nine hundred and seventy head of cattle brought to the island by Velazquez multiplied and were the source of beef and hides that were used for the expeditions to Mexico, and to Central and South America. These cattle brought to Cuba were descendants of the Bos Taurus Ibericus that was cross-bred with Northern European cattle. It was neither good in beef or milk production nor good for plowing and pulling. These facts forced the owners to breed this cattle in open areas, where for the first time Cuba proved to be an excellent breeding island. The Spaniards were extremely impressed by the procreational ability of the “Antillean herds”, as they called them. Unsupervised herds of thirty to forty cows would become, in a period of three to four years into herds of three to four hundred head. These Spanish cattle was to be the basis for the herds that covered the Americas from Texas to the Pampas. By the second half of the XVI century, hides (or “corambres”, as they called them) replaced gold as the principal medium of exchange in Cuba. It reached a point that cattle would be killed or slaughtered on the fields just to gather their hides that were used for export. The continued presence of roaming herds of cattle that encroached on plantations and crops forced the cattlemen, by Royal Order, to fence their properties and restrict their herds. By 1776, fenced properties were a reality in most of Cuba. It should be noted that by the year 1827 the value of the cattle existing in Cuba, one million head, was assessed at eighteen million dollars. When the year 1862 arrived, Cuba had over 1.25 M head of cattle and the number kept increasing until 1868 when the “Ten Years War” for independence began. The cattle industry suffered to the extent that three years after the fighting had ended, in 1881 the quantity of head barely reached the nine hundred thousand figure. Also something else happened; property ownership passed from Cubans to Spaniards. The cycle would repeat itself at the time of the Cuban War of Independence. By the year 1894 there were over 2.5 M head of cattle, and the industry was thriving. When the war began the following year and ended four years later, Cuba had three hundred and sixty thousand head left, but it had gotten free from Spain. The United States government in Cuba from 1899 to 1902 gave authorization to import, free of duty, cattle that was sold at cost to breeders. In December 1900, the imports began arriving to Cuba, mainly from Mexico, Central America, Venezuela and the Southern United States. The first imports totalled 5,400 head. The trend stopped later for a short while, but it was authorized again in 1908. It is extremely important to notice that during the U.S.A. government of Cuba, facilities to import, limits in number of cattle slaughtered, prohibition to export and creation of a department for control of diseases were of capital importance not only to the cattle industry but to the national economy as well. The trend on importing cattle continued, mainly from Latin America and the United States, and mostly bulls. The most important events during this time was the arrival via Southern U.S.A. of the Zebu breed from India (that played a big part in the improvement of the quality of the Cuban cattle) and in 1914, the First Cattle Exposition in Cuba at the Quinta de los Molinos, Habana, where cattle from Cuba, U.S.A., France, the Netherlands and West Africa were exhibited. From 1902 to 1925, Cuba imported 100 M lbs. 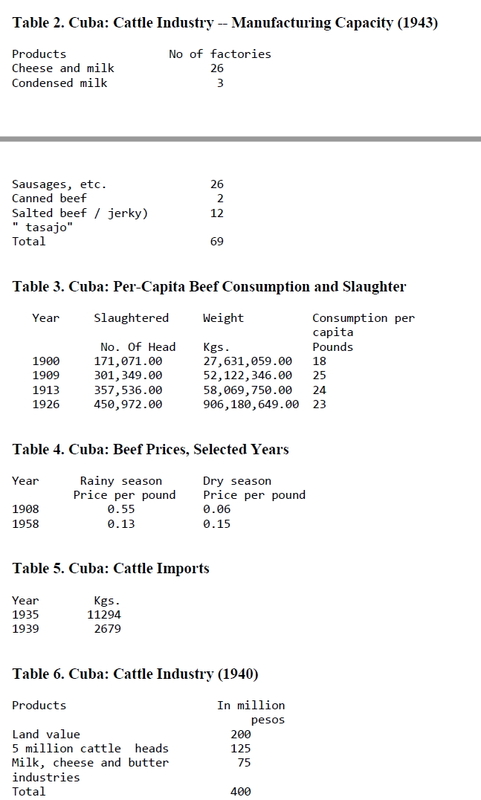 of “salted beef” annually; in 1938, Cuba imported 1 metric Ton valued at $241.00. By that time there were 35 factories packing “salted beef” in Cuba. At last, the island was self-sufficient! In 1927, Havana had to import most of its milk and eggs. By 1940 its needs were domestically taken care of. In 1940, Cuba had reduced its cheese imports to 20% of what it imported in 1937. A few years later there was no need to import. By 1950 two thousand specialized dairy farms existed in Cuba. It deserves mentioning that by 1940 more than 80% of the cattle land was owned by Cubans, and by 1958 that figure had increased to over 90%. Another interesting piece of information was the importation beginning in the late 1940’s of the Santa Gertrudis breed of cattle that, with the Brown Swiss and Brahma, would be in the 40’s and 50’s, the most popular imports in Cuba. Cuba’s cattle industry reached its highest point in 1958. The economy was excellent, the per capita intake of beef was 76 lbs. annually and 147 liters of milk per inhabitant was the figure. Both were among the highest in the world, and also their cost to the people were among the most inexpensive in the world. Furthermore, in 1957 the cattlemen that belonged to the “Association of Producers of High Quality Beef” had exported slaughtered steers and heifers to the U.S.A. on a yearly quota of ten thousand head per year at prices that were almost $ 0.04 per lb. higher than the going price of $ 0.13 $ 0.14 lb. in the domestic market. We should notice that when Batista exited from Cuba, the new Secretary of Agriculture, doubled the quota, but the later tragic events prevented this source of currency to continue its course. 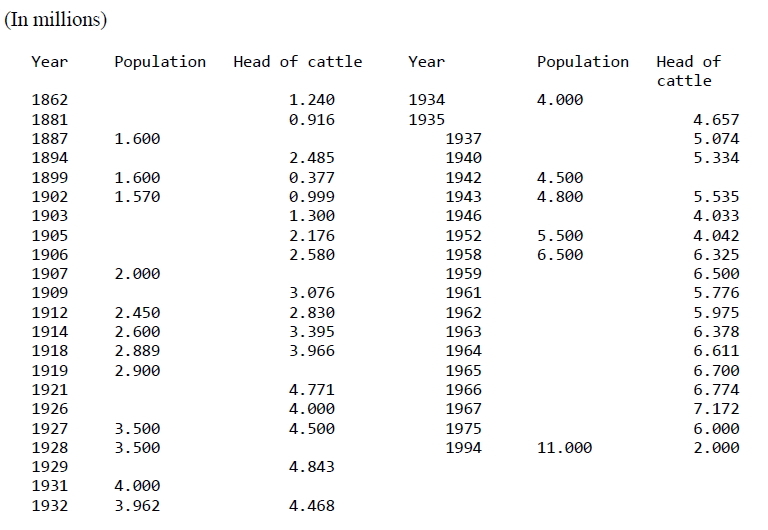 On the 31st of December of 1958 Cuba had a population of approximately 6.5 M people, the number of head of cattle was about the same, this ratio of about 1 to 1 had existed almost continually for over a hundred and fifty years and possibly longer than that. The area devoted to the cattle industry supplied the country with a milk production of 806,000 metric tons = 959,946,000 liters per year, and there were 835,000 head of cattle (average weight 900-1000 lbs) slaughtered yearly. The cattle industry story from January 1st, 1959 to now is a history of the most wanton destruction of a successful industry. From the very beginning the arbitrary decisions that were reflected and not respected within three different so called “laws of agrarian reform” set the basis for inconsistency and incompetence. Cattlemen were the first to conspire against the Castro regime, numerous cattlemen participated in raids against the communists and they were well represented at the Bay of Pigs fiasco. The cattle industry represented approximately between fifteen and twenty per cent of the population of Cuba. Three fourths of all land in Cuba had cattle (but only 20% realized the major section of farm income from cattle). The number of cattlemen plus their families totalled over three hundred thousand people (approximately 80% of them are still in Cuba), the employees and their families amounted to the same number, and the people employed in industries related to the cattle industry (milk, cheese, butter, canned beef, hides, tallow, forage, medical, fertilizers, weed killers, disease prevention, etc) totalled about the same number as either one of the previously mentioned. The number of property owners among the cattlemen were approximately one hundred and twenty five thousand, but there was as large a number of people that worked in other fields (doctors, lawyers, bankers, store owners and employees, truck drivers, accountants, railroad workers) that owned cattle, and ranch employees were also represented among cattle owners. We cannot leave out either the large number of people that owned cattle and made a living devoting all their time buying and selling cattle which they kept on a rental basis on lands owned by others. The ranches were usually run by the owner (either as a manager or a worker) helped by his family. Larger ranches had a manager under the owner and the same as the smaller ranches had a number of employees. The number of farms that, besides ranches, had cattle, were abundant; as they were used for plowing, pulling, milk producing, etc. ; mostly for the small farmer’s use. The employees of ranches received a monthly salary or a daily wage, but they all were protected by the Cattlemen Retirement Fund established in 1951. They also enjoyed the benefits that covered their wives’ maternity costs. The funding of this plan was paid by the ranch owner (1/2 of 1%) and the employee (1/4 of 1%) of the employee’s wages. The salaried employees were entitled to one month paid vacation after eleven consecutive months of work. And all employees were protected by the accident insurance carried by the ranch. It is very important to notice that there were a number of temporary workers hired at many ranches when the cane cutting season ended, to do the extra work required. And it is extremely important to note that carpenters, mechanics, electricians, plumbers and construction workers were used at cattle ranches, where the presence of veterinarians and land surveyors was part of the industry. On the other end of the industry we find the truck drivers, the milkmen, the cattle brokers, buyers and agents, the insurance companies’ representatives and office workers, the pharmacists and employees of stores where vaccines and drugs were sold, the manufacturers of saddles, branding irons, blankets, etc. and last, but not least the butchers, slaughter house employees, meat salesman, workers at cheese, butter, hides, tallow, etc. factories. The cattlemen were entrepreneurs that improved the breeding techniques and the quality of the Cuban cattle, but, who also introduced in Cuba high nutritional value grasses as “faragua,” “pangola,” “bermuda” and “colonial” to the already existing “guinea,” “texana,” “parana,” and others. The Communist regime expropriated some ranches with their cattle; in other cases it took part of the land and part of the cattle. Eventually, they took everything, with the exception of some farms of less than sixty-six acres. To all intents and purposes the cattlemen no longer existed. For a while, the Communists tried to maintain the ranches as they were when their owners ran them, but the flaws appeared right away. The INRA (Institute of Agrarian Reform) was not capable, in the first year of its existence, to meet the production of 1958, and in the process swallowed $ 39 M. What happened to the donations and expenses that the INRA incurred that totalled $ 497 M as per Antonio Nuñez Jiménez statement to “Bohemia” magazine and the INRA report of March of 1961? The beginning was bad, the end result was worse. The “reformers” of 1959 totally ignored the universal principle that allows the state the right of expropriation for public benefit, with previous just payment of indemnization: The bonds never went to press. Large portions of the confiscated land were left abandoned, and by 1964 they were full of weeds and shrubs. But the government did not care, they had decided to concentrate all the cattle in certain areas in order to take the steps necessary for growing sugar cane everywhere. One of the great schemes of the Communist government was the creation of the F1 and F2 breed that was supposed to develop cattle of exceptional qualities of beef and milk production combining Brahma with Holstein and with Brown-Swiss. It was not successful. As the process continued through the years, large quantities of cattle were slaughtered and exported without a set pattern, depleting the industry. It is interesting to observe that for years cattle was exported by the cattlemen without hurting the domestic market that never lacked beef, milk, eggs, or cheese, for the population of the republic. In 1967 the Communists claimed that they had reached the figure of 7M head of cattle, but from then on the ratio of population to cattle began to decline; as all the cattle products supplies did also. By the year 1980 the sugar cane production dream had been unfulfilled, and the cattle industry had paid the supreme price. In spite of the fact that most of the figures from Communist countries have proven, after the collapse of the USSR empire to be false, we can reasonably consider that the figure of 4M head of cattle could be deemed correct for that year (1980). Now, fourteen years later, the figure could be 2M head of cattle in Cuba, and according to some information it could even be less. And what does the future bring to us? Assuming the regime collapses within the next year, the task ahead is enormous. For years, Cuba was the land of experiments. Against proven results, numerous individuals and so called “experts” tried to change the economic, the political and the legal structures on the island. Unfortunately, some people believe that Cuba and its people should suffer more by suggesting that the country endure more experiments. The bureaucrats and technocrats that helped create the situation, talk about, among other things, of not returning to the Constitution of 1940, of the refusal to return the land to their legitimate owners, and even some politicians and demagogues talk about selling, by different methods, what they did not own, do not own, and legitimately might never own. In other words, legitimize Castro’s robberies. The cattlemen, that for years have refused to accept anything but restitution of their properties, claiming not only legal but moral rights, have received within the past two years legal help by the approved resolutions and laws that govern the actions of the U.S.A. and the nations members of the OAS. These are the Free Cuba Democracy Act (1992), better known as the “Torricelli Law”, the Annual Report of the OAS Inter-American Human Rights Commission (1993) made public in June 1994 (pages 493, 498), and The Law for Authorization of Foreign Affairs (April 21, 1994) section 527. They all condition, limit or restrain the diplomatic, economic and financial actions of the USA to human rights. Accepting as an accomplished fact the restitution of their properties, how can the cattlemen restore the productivity to their ranches in order to fulfill their social function? First of all, peace, democracy and rights, should exist. Next, comes financing. The industry will be able to put to work at least 1/2 M people immediately, due to the unparalleled destruction that has occurred. Imports of cattle from areas of the Southern part of the United States (mainly from Florida) and the Caribbean area countries is a must. Loans should be obtained with a moratory of payments (principal and interest) for the first year and preferably for the first two years. It is suggested that crops like corn, beans, and others could be planted to supplement not only the income of the ranch, but to create more work for the population. Due to the great extensions of land that are covered by “marabu” (wooden leguminous) large numbers of workers could be employed in eliminating this plague and producing “coal” for cooking use. The establishment of property boundaries with the erection of fences and the return of the land to pastures are extremely important, because grass is the most inexpensive source of food for cattle. (And we cannot make the same mistake the Communists have done not only in Cuba, but all over the world, spending more in producing beef than in what it can be sold for). Breeding cattle has to begin immediately, either by the less expensive method of a bull for every twenty five to thirty cows or heifers, or by the more expensive method of artificial insemination. (Unless the centers built by the Communists can be of any use immediately). At least fifty thousand cows and heifers have to be imported immediately, and within the facilities available, try to induce rapid reproduction in order to obtain at least 80% off springs. A large percentage of male calves could be used for slaughter within a year to expedite the need of the population for the excellent producer of protein: beef. The milk production can be put into improved production when the cows produce offs prings. And as in the case of artificial insemination, if the dairy farms equipment is in working condition, the situation will be better. A very important reality that will be found is the imbalance between the sweet water and the salt water, caused by the construction of numerous dams and reservoirs in rivers and creeks. To that it can be added the salt water intrusion that has occurred (mainly in the southern part of Cuba) up to ten miles inland in some places. When we talk about what has to be done there is a premise that must be established: grass and cattle complement each other, and both are important to the human population. Grass, natural and improved, is not only the cheapest but the most efficient raw material that exists for the economic production of beef; it affords protection against erosion, produces organic matter in the soil preventing desertification, and also certain grasses return to the soil the nitrogen extracted by crops helping reconstruct the thin layer of organic top soil. (Marabu has helped the soil with nitrogen during all the years it has hurt the pastures of Cuba). Beef produces protein for tissue formation, zinc for growth, iron for blood hemoglobin, phosphorous for bone formation, and various vitamins that transform carbohydrates into energy (B1), help protein molecules (B6) and Riboflavine for the enzymatic system. In Cuba it will be necessary to look at the situation that is presenting itself in the U.S.A., such as the fact that in the beef cattle industry the cattleman has to be better informed as to beef carcass and product traits due to the fact that the industry is changing from an animal-oriented emphasis based on production to beef production evolution. Also, genetic selection and designed crossbreeding to produce predictable cattle, applied to calves will be a must. Why? Because Cuba’s climatic conditions cause her to be a prime source of cattle for export at costs cheaper than many other countries. We must take into consideration the fact that countries like Germany and Great Britain are importers while Argentina, Australia and New Zealand are exporters; Cuba can join the latter group due to its proximity to the United States and to the fact that the European countries are economically tired of subsidizing their beef production which has become a burden to their economy. Cuba exported cattle, beef and butter before, and can do it again! Furthermore, the Cuban population shall be able to obtain goods that were not within their reach because they had to be exported as payment for weaponry and international subversion.